Looking for padlocks? Call Allstrong for padlocks on 1800 550 750. Don’t waste any more time searching for padlocks. Got a padlock you can’t open any more? Need quality padlocks for your home or business? Allstrong Locksmiths supply and repair all types of padlocks ranging from budget domestic padlocks through to high-security restricted system padlocks for commercial purposes. This includes Energex Padlocks and Safety Lockout Locks. 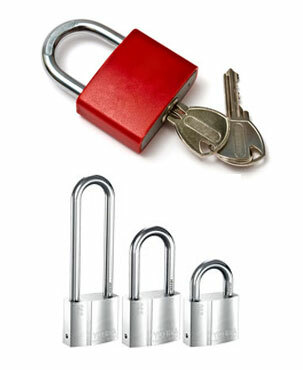 We supply commercial padlocks to councils, energy companies, contractors and general industry. These can be ABLOY Padlocks, Rekeyable padlocks, Weather Protected Padlocks. All available Keyed Alike with various shackles sizes and on a Restricted Security Key if required. We even offer replacement keys for many types of padlock, and can often supply padlocks to suit an existing key. To view our full range of padlocks, or for expert advice on which padlocks are best for your needs, call 1800 550 750 now and we’ll come to you! For padlocks and security advice call now 1800 550 750.